Deepak Prabhakar, MD, MPH is the medical director of outpatient services for Sheppard Pratt Health System. 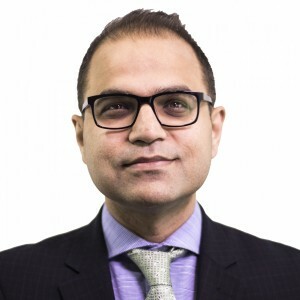 He earned his MD at NHL Municipal Medical College, and completed his residency in psychiatry and fellowship in child and adolescent psychiatry at Wayne State University. Dr. Prabhakar is board certified in both general psychiatry and child and adolescent psychiatry. His research interests include depression, suicide, psychiatric education, and physician distress. He also specializes in sports psychiatry. Dr. Prabhakar is certified by the National Football League and the Major League Baseball. Dr. Prabhakar has presented nationally and internationally at the annual meetings of the American Academy of Child and Adolescent Psychiatry (AACAP), The American Association of Directors of Psychiatric Residency Training (AADPRT), Association for Academic Psychiatry (AAP), American Psychiatric Association (APA), and the World Psychiatric Association-Epidemiology (WPA). Prabhakar D, Peterson EL, Hu Y, Rossom RC, Lynch FL, Lu CY, Waitzfelder BE, Owen-Smith AA, Williams LK, Beck A, Simon GE, Ahmedani BK. Dermatologic conditions and risk of suicide: a case-control study. Psychosomatics. 2018:59:58-61. PMID: 28890116. Ahmedani BK, Peterson EL, Hu Y, Rossom RC, Lynch F, Lu CY, Waitzfelder BE, Owen-Smith AA, Hubley S, Prabhakar D, Williams LK, Zeld N, Mutter E, Beck A, Tolsma D, Simon GE. Major physical health conditions and risk of suicide. Am J Prev Med. 2017;53(3):308-15. PMID: 28619532. Pheister M, Stagno S, Cotes R, Prabhakar D, Mahr F, Crowell A, Schwartz A. Simulated patients and scenarios to assess and teach psychiatry residents. Acad Psychiatry. 2017;41(1):114-7. PMID: 26763534. Baker-Genaw K, Kokas MS, Ahsan SF, Darnley-Fisch D, Drake S, Goyal N, Inamdar K, Moutzouros V, Prabhakar D, Rolland L, Sangha R, Shreve M, Woodward A. Mapping direct observations from objective structured clinical examinations to the milestones across specialties. J Grad Med Educ. 2016;8(3):429-34. PMID: 27413450. Prabhakar D, Balon R, Anzia JM, Gabbard GO, Lomax JW, Bandstra BS, Eisen J, Figueroa S, Theresa G, Ruble M, Seritan AL, Zisook S. Helping psychiatry residents cope with patient suicide. Acad Psychiatry. 2014;38(5):593-7. PMID: 24664605. Prabhakar D, Anzia JM, Balon R, Gabbard G, Gray E, Hatzis N, Lanouette NM, Lomax JW, Puri P, Zisook S. "Collateral damages": preparing residents for coping with patient suicide. Acad Psychiatry. 2013;37(6):429-30. PMID: 23653109. Zisook S, Anzia J, Atri A, Baroni A, Clayton P, Haller E, Lomax JW, Mann JJ, Oquendo MA, Pato M, Perez-Rodriguez MM, Prabhakar D, Sen S, Thrall G, Yaseen ZS. Teaching evidence-based approaches to suicide risk assessment and prevention that enhance psychiatric training. Compr Psychiatry. 2013;54(3):201-8. PMID: 22995449.